Following on from our first patch of dwarf citrus, a family work gang has helped us plant out our second patch. This is of full-sized citrus, with supporting guild. With full-sized rather than dwarf citrus, patch 2 is a little under twice the size of patch 1. The ‘spine’ of the planting are three Elaeagnus Ebbingei a nitrogen-fixing plant that increases the fertility of fruit trees, and is highly-recommended for permaculture gardens. There’s a mix of native citrus (eg finger lime), introduced citrus (eg navel orange) and a few that are hybrids of the two (eg sunrise lime). As before, everything is sheet mulched, with a bunch of ‘in-fill’ plants to go in shortly to shade out any weeds. With Spring coming, lets see how this patch goes! This entry was posted in Edible forest gardens, Growing our own food, Lewisham farm, Uncategorized and tagged citrus, edible forest garden, permaculture, winter. The big plan for our rural property is to create something called an “edible forest garden”, as described in the book by the same name by Dave Jacke and Eric Toensmeier. This is like the “food forest” concept described in permaculture, but on steroids. Contrast this to a typical orchard: the trees are carefully spaced to maximise production, but underneath there’s nothing but grass that needs to be constantly mowed. The trees themselves need constant feeding and management. The orchard produces the most fruit, but only the fruit. The edible forest garden has more competition between plants, so the canopy produces less. But when you add up all the food produced at all the layers, it wins hands-down. Better yet, by mimicking a normal forest, only a little management is needed, and hopefully no maintenance. Has this been done in Australia? The original ideas come out of North America and the UK, and this is where most of the real-life examples come from. I’ve heard of a few small-scale gardens in Australia, but I suspect there’s not many in total. So my goal is to fully explore this concept in temperate Australia, utilising native bushfoods and rainforest plants wherever possible. The books are very heavy-weight, and the approach requires a huge amount of planning. It may be 6-12 months before even the first plant goes into the ground. I’ll write up our journey as it progresses, starting with our goals for the edible forest garden, and then working steadily down into design details. This entry was posted in Edible forest gardens, Native gardens, Uncategorized and tagged edible forest garden, food forest, permaculture. Over the years, we’ve implemented an tremendous series of improvements to our house in Lewisham. We’ve been growing all our greens, collecting eggs from our chickens and harvesting honey from the beehives on our roof. We’ve also guerrilla gardened our verge, the convent behind us and alongside the railway station. But our ambitions haven’t stopped there, and I’m pleased to say that as of today, we’re now going to be farmers! After much searching, we’ve purchased a 22ha (56acre) property in the hills overlooking Berry on the South coast. The lovely two-story cottage sits on the side of a hill, with a backdrop of lush rainforest. Amongst the trees, there are six main fields which total about 4-5ha (8-10acres), with a rural zoning. Fear not, we’re not leaving Lewisham! For the next while, this will be a weekender for us, with our main residence remaining in Sydney. This entry was posted in Growing our own food, Lewisham farm, Uncategorized and tagged berry, farm, permaculture. At Lewisham House, we love growing citrus. But it’s a hungry crop, and high maintenance. Now one of the core concepts in permaculture is that of a “guild”. The idea is that instead of just planting a tree by itself, you plant it with a community (a “guild”) of other plants, which provide supporting services. This might include extra nutrients, attractants for beneficial bugs, and the like. If you search the net, you’ll find plenty of diagrams for apple tree guilds, hazelnut guilds, and other northern hemisphere deciduous trees. But not for citrus trees (that I could find). So I did a fair bit of reading and thinking, and these are my draft citrus guilds, for Australian warm temperate conditions. All feedback welcome! Citrus trees are gross feeders. So the guild has to produce a lot of nitrogen, and other fertilisers, to support the citrus. Design for full-sized and dwarf trees. 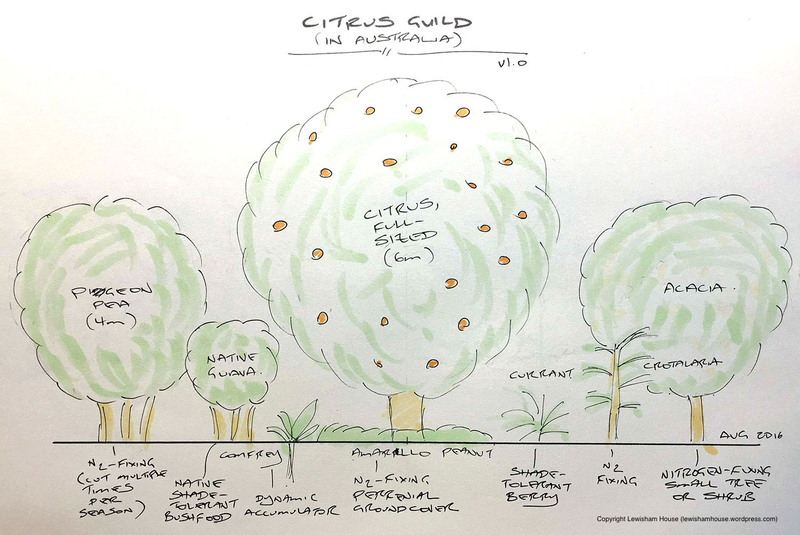 Dwarfed citrus trees are widely available, and can be very useful in a permaculture context. Minimal maintenance. Ideally, once setup, the guild runs itself. Plants have to be available in Australia. There are plenty of great permaculture plants (like goumi), which I just can’t find in Oz. Australian natives wherever possible. Rainforest plants are particularly useful, as they’re acclimatised to shade and competition. Warm temperate or sub-tropical. Some of the species I’ve chosen would likely struggle in colder conditions. I’ve packed in as many nitrogen-fixing species that I can, with a mix of native and introduced species. A linear arrangement is just one possibility, and it happened to match some other design work that I was doing at the time. Does this guild work in practice? I’m just starting to experiment in the real world, so all feedback and suggestions welcome. Have I missed any good plants that can serve a productive purpose in the guild? Again, all suggestions encouraged. Are there other citrus guild drawings that I’ve missed? Please post links in the comments below. This entry was posted in Edible forest gardens, Growing our own food and tagged citrus, guilds, permaculture, permaculture guilds. Creating an “insect hotel” has been on my to-do list for a while now. The idea is a simple one: create a habitat for beneficial bugs to hibernate and breed in. The result should be more of the good bugs, leading to less of the bad bugs. The great blog post on insect hotels by Inspiration Green was my starting point. This showed the huge diversity of shapes, sizes and materials of insect hotels. My starting materials were a few pieces of well-aged firewood, and some handy bamboo garden edging from Bunnings. The outside frame was made from cut-down 90x45mm pine, still left over from the renovation. The wood and bamboo was cut to 90mm long to match. The two slow bits were drilling all the holes (6-9mm in size), and then gluing it all together. It makes for an attractive addition to the garden! The result is not just useful, but beautiful (I think so at least). It looks great on the side fence of our house. And as it’s visible from the street, it’s yet another item of interest for passerbyers. Have insects already made a home? The really encouraging thing is that a few of the holes have already been filled — so hopefully this means some friendly bugs have already made a home! 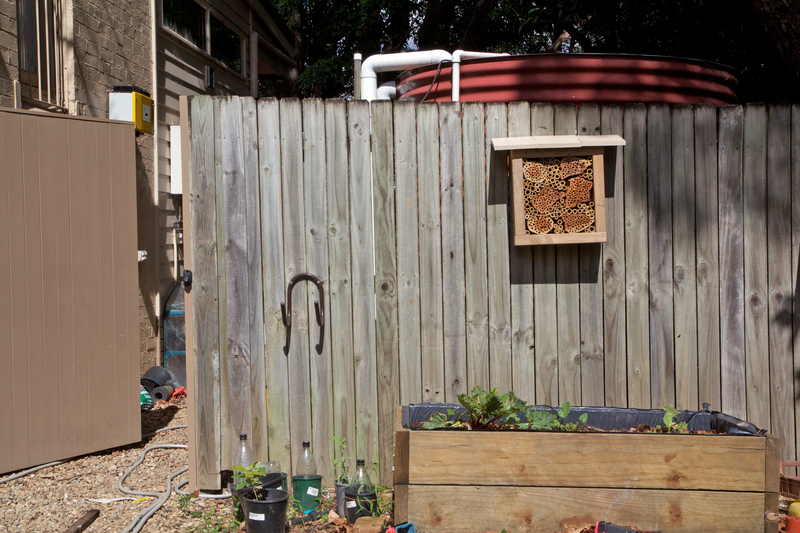 This entry was posted in Growing our own food, Saving the environment and tagged beneficial bugs, insect hotel, permaculture, pests. A supermarket in London is growing produce on their roof to show produce can be grown in cities and sold locally. The project, which is the first of its kind, is called Food From The Sky. The store sells its organic roof-grown produce on Fridays, and waste is composted. This entry was posted in General chit-chat and tagged city gardening, permaculture. A few weeks back I spent a weekend learning about bees and natural beekeeping. The course was presented by Tim Malfroy (of Malfroy’s Gold), and organised by Milkwood Permaculture. Bees have always been an interest (which is why we have native stingless bees already), and this seemed to be an ideal opportunity to learn more. As it turned out, this was more than traditional (ie commercial) beekeeping. Instead, Tim taught us about “natural” beekeeping, which is much more in tune with the needs and desires of the bees. Keeping the bees in a Warre Hive, they are able to grow their own honeycomb, at their own pace. There are numerous benefits, including a greater resistance to pests and diseases, and more suitability for backyard beekeeping. But most of all, the bees are more relaxed and happy! So no angry bees when the hive is opened, and little to no protective gear. In the video I recorded above on my iPhone, the whole class is clustering around the hive, and only a few are wearing protective clothing. Everyone felt completely at ease, and it all seemed very natural. I’d highly recommend the course, and Milkwood have new dates coming up shortly. This entry was posted in Beekeeping, Growing our own food, Saving the environment and tagged beekeeping, bees, milkwood permaculture, permaculture.